For people named Dormer, see Dormer (surname). A dormer is a roofed structure, often containing a window, that projects vertically beyond the plane of a pitched roof. A dormer window is a form of roof window. Dormers are commonly used to increase the usable space in a loft and to create window openings in a roof plane. 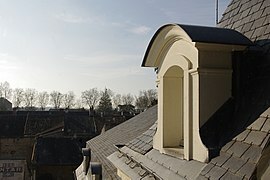 The term "dormer" is commonly used to refer to a "dormer window" although a dormer does not necessarily contain a window. A dormer is often one of the primary elements of a loft conversion. As a prominent element of many buildings, different types of dormer have evolved to complement different styles of architecture. When the structure appears on the spires of churches and cathedrals, it is usually referred to as a lucarne. Gable fronted dormer: Also called simply a gabled dormer, this is the most common type. It has a simple pitched roof of two sloping planes, supported by a frame that rises vertically to form a triangular section below the roofline, i.e. a gable. It is also known as a dog-house dormer (due to its similar shape). Hip roof dormer: Also called a hipped dormer, it has a roof composed of three sloping planes that rise from each side of the dormer frame and converge at the ridge—analogous to the hip roof. 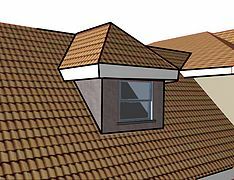 Flat roof dormer: The roof of this dormer is a single flat plane approximately horizontal (although usually slightly inclined to allow rain water to run off). Shed dormer: This dormer also has a single flat plane roof, but in this case, it is sloped in the same direction as the principal roof, only at a shallower angle. A shed dormer can provide head room over a larger area than a gabled dormer, but as its roof pitch is shallower than the main roof, it may require a different roof covering. Wall dormer: As opposed to the dormer being set part way up the slope of the roof, this is a dormer whose face is coplanar with the face of the wall below. This means that the face of the dormer is essentially a continuation of the wall above the level of the eaves. Eyebrow or eyelid dormer: A low and wide dormer with a curved roof and no sides. Instead, the roof covering is gradually curved up and over the dormer in a flattened bell curve. Link dormer: This can be a dormer that houses a chimney or a dormer that joins one part of a roof to another. Bonneted dormer: This is an arched roof dormer, rounded in shape when viewed from front. Popular in Victorian homes, especially in certain areas, like the Southcott-style row-houses called Jellybean Row in St. John's, Newfoundland. Nantucket dormer: This is a three-in-one dormer structure composed of two gable dormers connected by a shed dormer in between. Lucarne: A dormer on the slope of a gothic spire, usually slender and gable fronted. 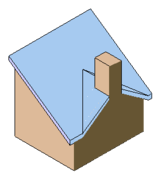 Blind or false dormer: A dormer that is only visible externally, i.e. does not provide any extra space or light internally. These are often used to make the house appear more aesthetically impressive. The word dormer is derived from the Middle French dormeor, meaning "sleeping room", as dormer windows often provided light and space to attic-level bedrooms. One of the earliest uses of dormers was in the form of lucarnes, slender dormers which provided ventilation to the spires of gothic churches and cathedrals. An early example are the lucarnes of the spire of Christ Church Cathedral, Oxford. Dormer windows have been used in domestic architecture in Britain since the 16th century. Dormer windows were popularised by French architect Francois Mansart, who used dormers extensively in the mansard roofs he designed for 17th-century Paris. Today dormers are a widespread feature of pitched roof buildings. 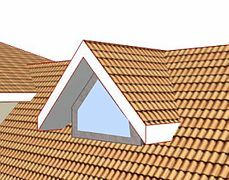 In some localities, permission must be sought for construction of dormers and other features. In England and Wales, the General Permitted Development Order states classes of development for which such planning permission is not required. Such rights are only applicable outside conservation areas, national parks, Areas of Outstanding Natural Beauty or The Broads. Dormers may introduce imbalance in the street scene and be seen as inappropriate within the local setting of streets and buildings. ^ "Definition of dormer". ArchitecturalDictionary.org. Retrieved 23 May 2016. ^ a b Barr, Peter. "Illustrated Glossary - 19th Century Adrian Architecture". Sienaheights.edu. Retrieved May 23, 2016. ^ "Dormer Types: Gabled". 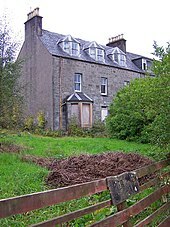 ThisOldHouse.com. Retrieved 25 May 2016. 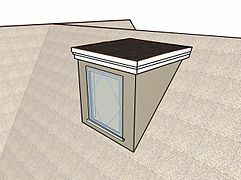 ^ "Dormer Types: Hipped". ThisOldHouse.com. Retrieved 25 May 2016. ^ "Eyebrow". Buffaloah.com. Retrieved 2012-09-28. ^ Gitlin, Jane (2003). Capes: Design Ideas for Renovating, Remodeling, and Building New. Newtown, CT: Taunton. p. 44. ISBN 9781561584369. ^ "Etymology of "dormer"". Online Etymology Dictionary. Retrieved 23 May 2016. ^ "Traditional Dormer Windows: Design Guide". tewkesbury.gov.uk. Tewkesbury Borough Council. Retrieved 23 May 2016. ^ Maddox, Nathania. "ABOUT DORMERS". chicagometalsupply.com. Retrieved June 17, 2015. ^ a b "Permitted Development Rights". Planning Portal website. Gov.uk. Retrieved 14 October 2013. ^ "Policy advice note: Garden city settlements" (PDF). TCPA. October 2008. Retrieved 14 October 2013. ^ About Loft Conversions (2008). "Dormer Loft Conversion", About Loft Conversions. 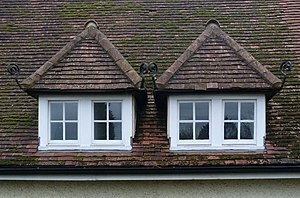 Wikimedia Commons has media related to Dormer windows.